79-110-04 White Pearl Airbrush Base 4 oz. 79-120-04 Platinum Pearl Airbrush Base 4 oz. 79-122-04 Silver Pearl Airbrush Base 4 oz. 79-212-04 Blue Pearl Airbrush Base 4 oz. 79-253-04 Light Teel Pearl Airbrush Base 4 oz. 79-263-04 Deep Violet Pearl Airbrush Base 4 oz. 79-421-04 Lime Green Pearl Airbrush Base 4 oz. 79-530-04 Classic Orange Pearl Airbrush Base 4 oz. 79-615-04 Screaming Yellow Pearl Airbrush Base 4 oz. 79-647-04 Gold Mine Pearl Airbrush Base 4 oz. 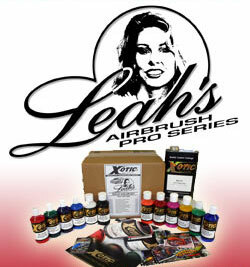 79-700-04 Red Pearl Airbrush Base 4 oz. 79-710-04 Cranberry Pearl Airbrush Base 4 oz. 79-735-04 Pink Pearl Airbrush Base 4 oz. 79-750-04 Hot Pink Airbrush Base 4 oz. 79-803-04 Black Gold Pearl Airbrush Base 4 oz. 50-11–1-32 Fast Reducer 32 oz.